Contributor Peter Boccanfuso (ex-Student, Old Boy, Long-term Committee Member and Patron) with a little help from his wife Liz. Rod Watson and I first met at a wedding in Leura on the 20th of January 1984. The girl getting married worked for me at the time and Rod and I were at the same table. 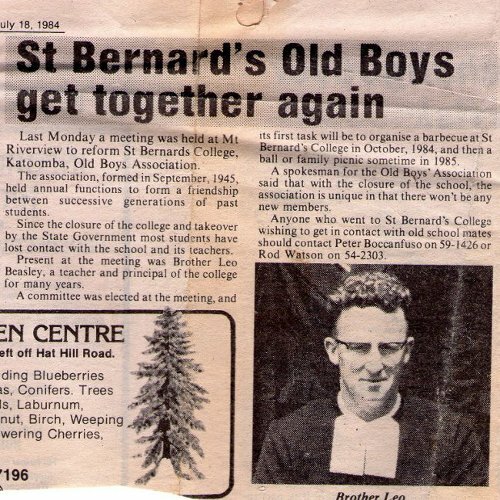 After realizing that we had both gone to St Bernard's we started discussing the possibility of rekindling the Old Boys' Assocation, and the different people we could contact. The first meeting was at my place sometime after. There was no great science to it, we just got a few of the Old Boys together and threw around a few ideas...and the rest is history! Website Compiler's Note: The article on the right, also courtesy of Peter Boccanfuso, is from The Blue Mountains Gazette dated 18th of July 1984. The Letter below, was written in 1987, by one of the first Old Boys' and a member of many SBOBA committees, Ken Bowman. Thank you Ken. A LINK FROM THE OLD SBOBA TO THE NEW SBOBA. I read with interest the April Newsletter and I hope more of the early 1940's crew make contact. I did, by way of a photo-stat copy of the 1944 Annual Report and a brief letter giving you the whereabouts of Trevor Bailey who commenced in 1942 the same year as John Toomey. Trevor is keen to join the Association. I also sent a copy to Pat Quealy - as he expressed an interest in it. I recall the first Old Boys' Association in the mid '40's' when we used to meet in the lounge of the Elizabeth Hotel where Tom Maher's parents were licencees. Some of the names of those attending that come to mind were - Tom Maher, John Burnheim, Don Foy, Leigh Whatmore, Roger Green and his brother - to name a few. Bro Patrick, together with three or four Brothers, used to play cricket in the Blue Mountains Competition others in the team, besides myself, were - Mick Stollery, Ken Mitchell and I think John Madigan. I recall having my turn as Umpire and giving Bro Patrick out when he hit on the pad stepping down the wicket to a ball. He could not possibly have been out, I realised later on. Bro Patrick was a good Cricketer - but I was not much of an Umpire! Bro Michael struggled valiantly to teach at least two unwilling pupils French - T. Bailey and I. He finally gave up and we were allowed to drop French. Bro Dermot, I recall taught primary classes and looked great at the Reunion. On my return from the UK in five months time I would be plesed to assist the Committee in someway, if you think of any assistance I could help with. Best wishes to you Brother and the Committee and thanks for all the work and effort you all must have put in to make the rejuvenated SBOBA such a great success. The Letter below, written in 2004, best sums up why we still have reunions. Thank you Fred Cox. MY SCHOOL REUNION or Something I forgot to do keeps me going back. I don’t know why the St Bernard’s College Old Boys’ Reunions are so significant to me. For goodness’ sake, the school doesn’t even exist anymore. Its dormitory doors closing for the last time back in 1966. Yet I keep going back each year, and I don’t intend missing this year’s, despite advancing age making the journey to Katoomba more tiring each time. It has something to do with my youth, I suppose. There must be something I forgot to do, but I really can’t tell you what. Oh sure, I’ve always wanted to tell Bro Cassian (the Principal in my time) he was wrong and my mother was right. I did amount to something, after all, and without too much effort on my part either. Maybe it’s not what she thought it would be, but that’s only because Bob Menzies kept on staying in that job! Come to think of it, I suppose my successes wouldn’t have impressed my teachers. Most of them are dead now, except for Bro Mark Murphy, so they wouldn’t have known. Isn’t that just like them, they always got the last word? How clearly I remember Sr Rhodes on a wintry morning, white nursing veil and red short cape on, briskly walking up from her cottage to attend to the chilblains on my ears. And old Nell, hand on hip as she replenished our teacups. Or dark-eyed Maria. I’d like to tell Tony Powell he should have got the best dressed award, if there’d been one at the time. I want to ask Michel Brossier why he didn’t do better with Jill Carter, or Vince Krijgsman with Jill Campbell. After all, Micky was muscular, nice looking and rather well liked, and Vince was also nive looking and already had an encyclopaedic knowledge of jazz. Choc Darbon was exotic, being French and olived skinned, but then there’s no accounting for girls, they do the dumbest things sometimes. Like Sue Wales with me. Pinching my chocolate biscuits cost Chas Munster whatever chance he ever had, which was not much, or ever getting into Heaven. As for Jack Egan, he kept me sane by getting me access to his father’s amazing collection of National Geographics, some dating back almost to the year I was born. The three Braga brothers were as homesick as me, their family being in Kowloon and mine in Hong Kong, and Tony Lee’s in Kuala Lumpur. And I recall John Whelan and John DeDiana doing some incredible things with a piece of inflated leather. I probably could have done just as well, I just couldn’t do it in public. Like Tommy Williams playing the piano at our school dances or Tony Hayes doing a wicked impersonation of Old Cassian tapping his finger to make a point. Tony Walmsley had the most incredible lot of freckles across his shoulders I have ever seen. But none of these things is what really keeps me going back to the reunions. No, the real reason I attend is something more. It’s something I almost forgot. It’s simply to say thank, thanks for the memories.